The Beantown Bloggery: Beantown Bloggery's Tweet Up Tuesday - TOMORROW! Beantown Bloggery's Tweet Up Tuesday - TOMORROW! I can't believe that it's Monday already. Where did the weekend go? Well at least this takes my mind off things a bit: The Bloggery's Tweet Up Tuesday Event is tomorrow - Tuesday 8/17. If you haven't RSVPed yet, now's the time. 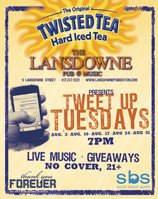 The Lansdowne Pub launched a new weekly event series called Tweet Up Tuesdays back in July and coming up in two weeks The Beantown Bloggery is going to be hosting! Free stuff, live music, no cover, and a chance to meet some of the Beantown Bloggery crew. What's not to love? 0 Response to "Beantown Bloggery's Tweet Up Tuesday - TOMORROW!" Us Weekly Hot Hollywood Party - Tonight! Ice Cream Showdown This Weekend! Will.I.Am at Underbar - TONIGHT!